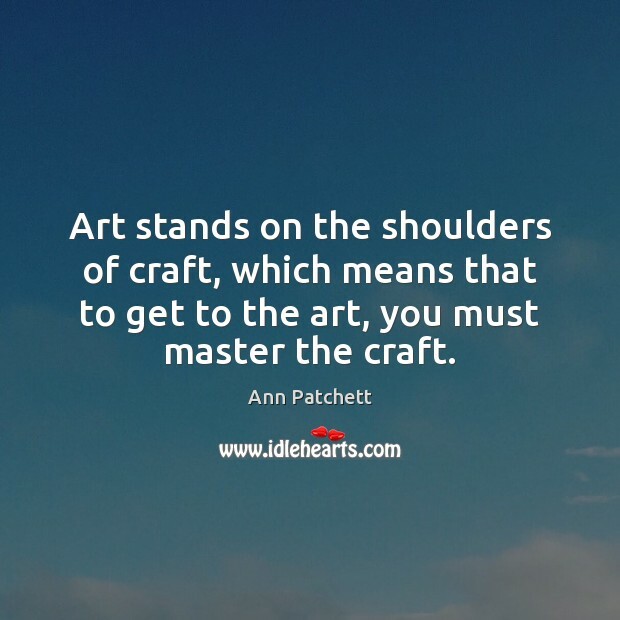 Enjoy the best inspirational, motivational, positive, funny and famous quotes by Ann Patchett. Use words and picture quotations to push forward and inspire you keep going in life! 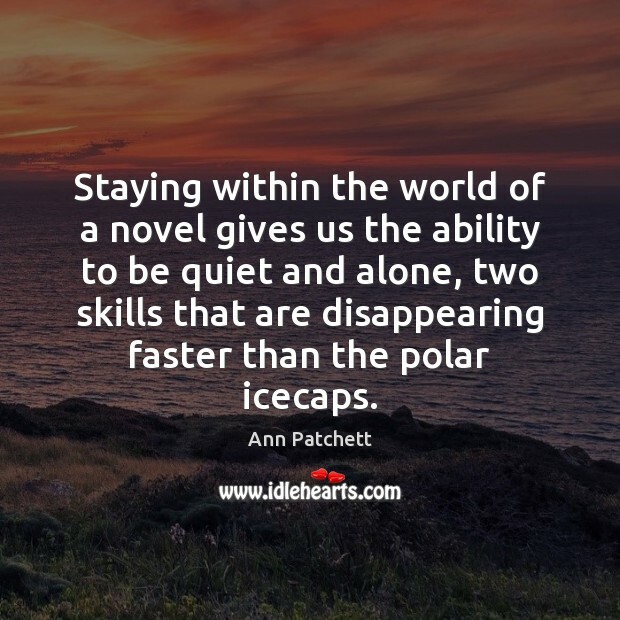 Staying within the world of a novel gives us the ability to be quiet and alone, two skills that are disappearing faster than the polar icecaps. When well told, a story captured the subtle movement of change. 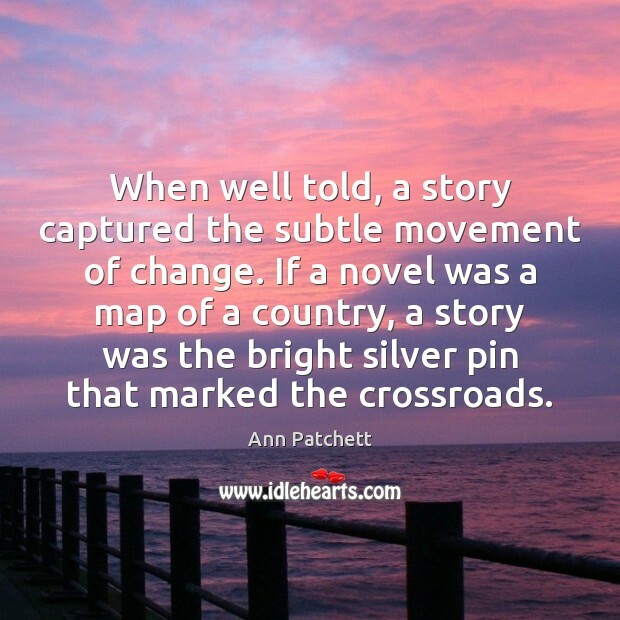 If a novel was a map of a country, a story was the bright silver pin that marked the crossroads. From my table inside I watch the glamorous women outside who are lunching on Spa Cobb salads without blue cheese or dressing. 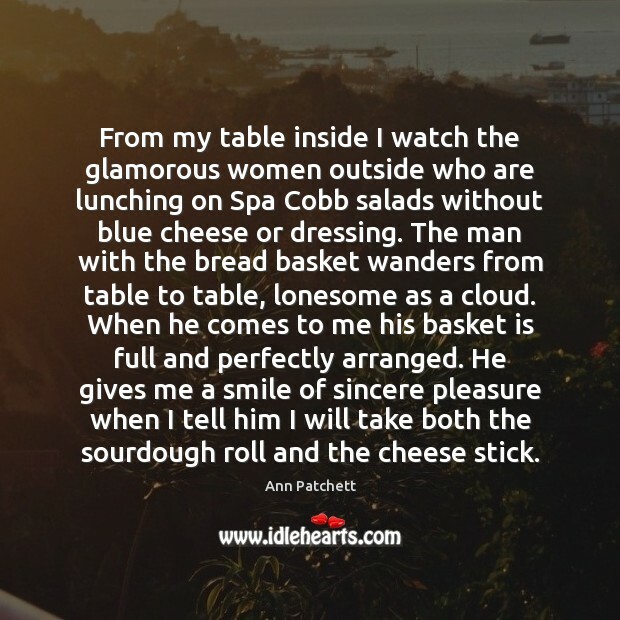 The man with the bread basket wanders from table to table, lonesome as a cloud. When he comes to me his basket is full and perfectly arranged. He gives me a smile of sincere pleasure when I tell him I will take both the sourdough roll and the cheese stick. 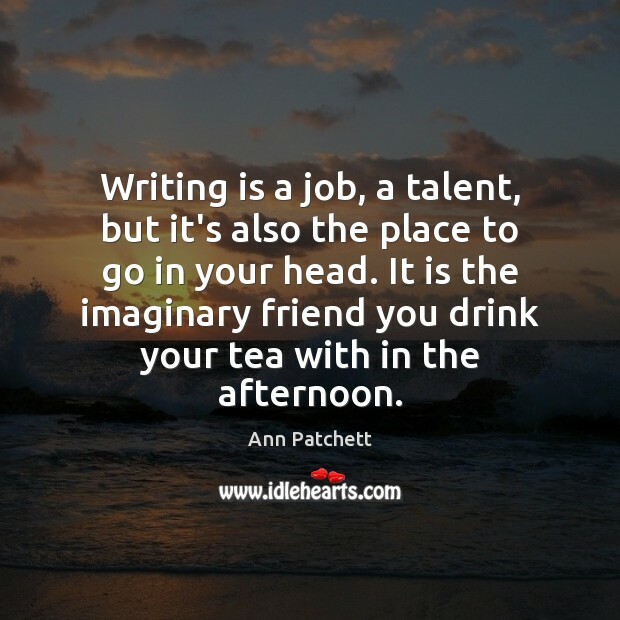 Writing is a job, a talent, but it's also the place to go in your head. It is the imaginary friend you drink your tea with in the afternoon. 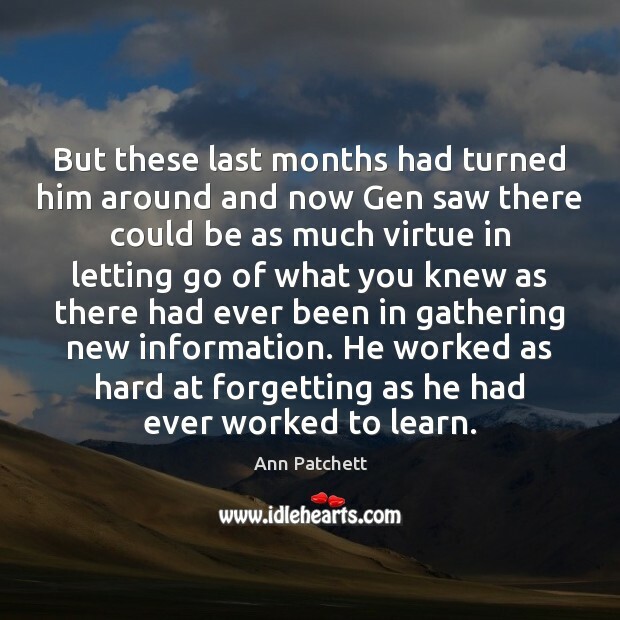 But these last months had turned him around and now Gen saw there could be as much virtue in letting go of what you knew as there had ever been in gathering new information. He worked as hard at forgetting as he had ever worked to learn. 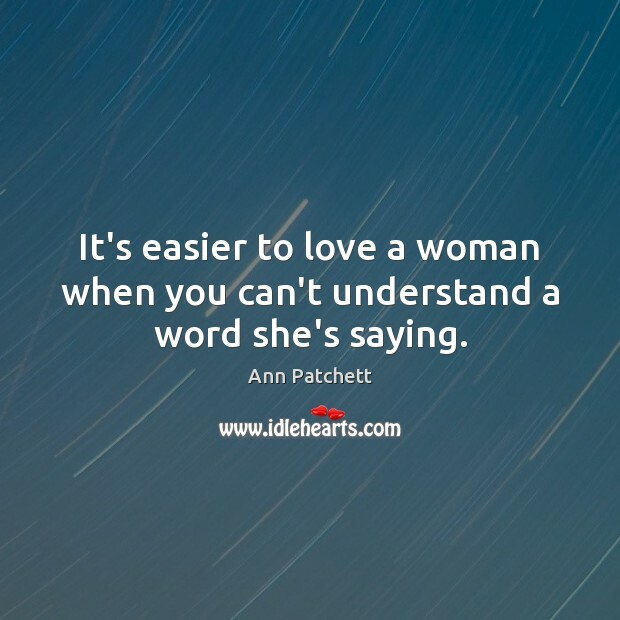 It's easier to love a woman when you can't understand a word she's saying. 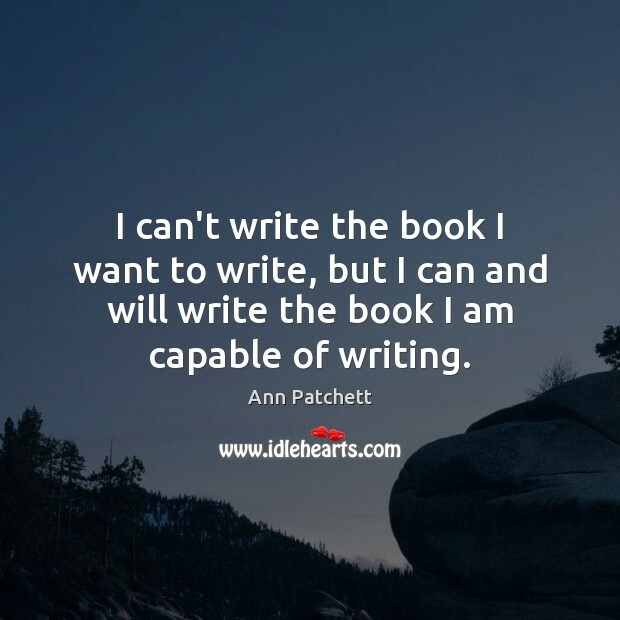 I can't write the book I want to write, but I can and will write the book I am capable of writing. There was no one clear point of loss. 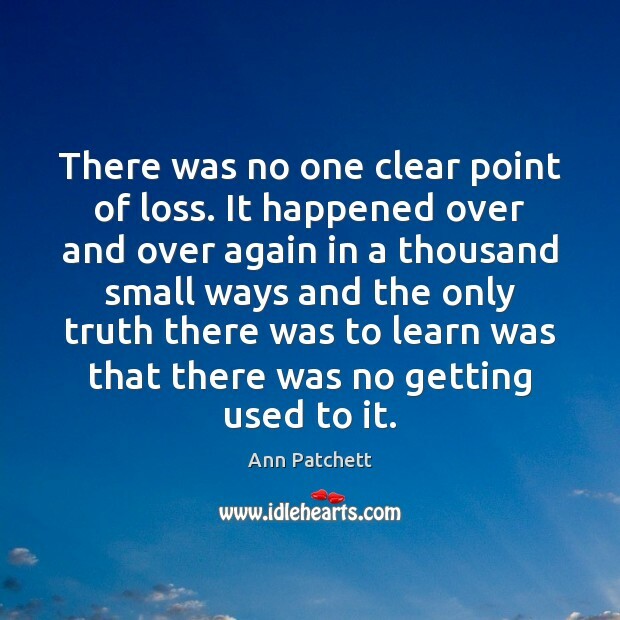 It happened over and over again in a thousand small ways and the only truth there was to learn was that there was no getting used to it. 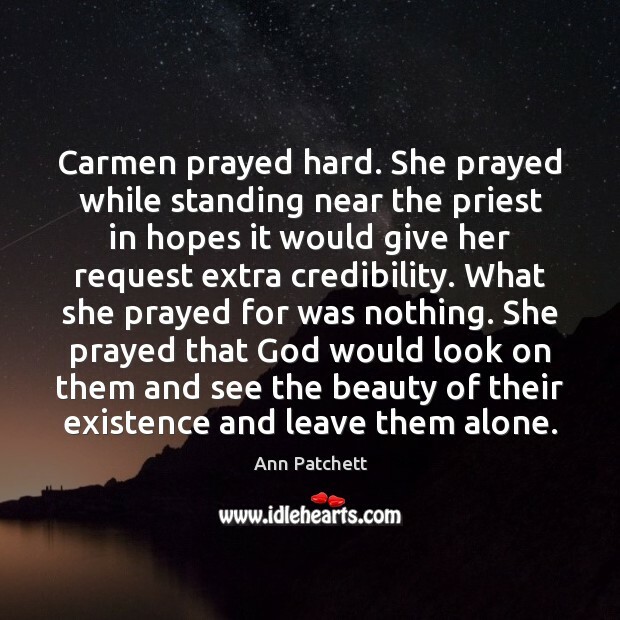 Carmen prayed hard. She prayed while standing near the priest in hopes it would give her request extra credibility. What she prayed for was nothing. She prayed that God would look on them and see the beauty of their existence and leave them alone. 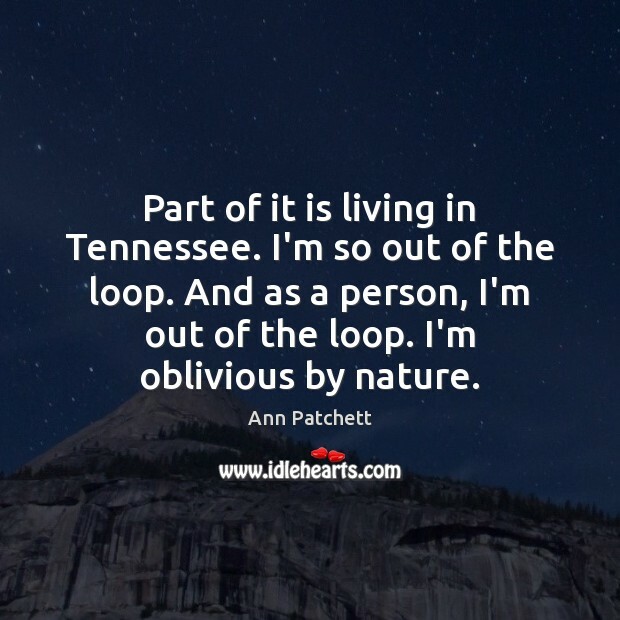 Part of it is living in Tennessee. I'm so out of the loop. And as a person, I'm out of the loop. I'm oblivious by nature. 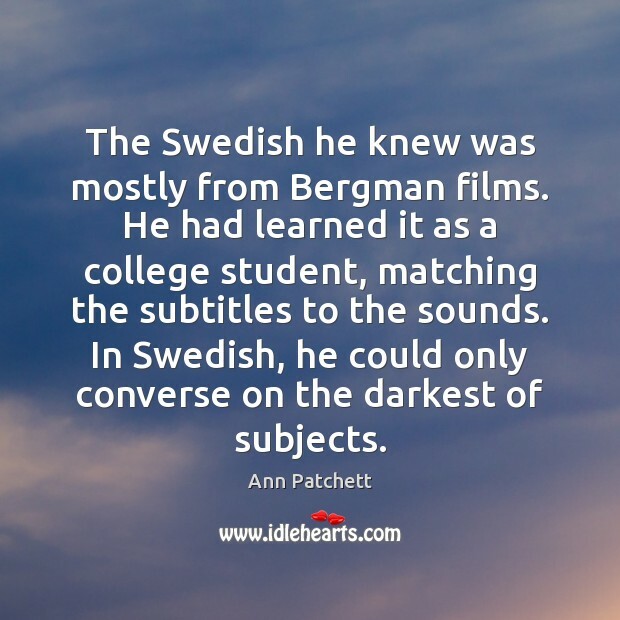 The Swedish he knew was mostly from Bergman films. He had learned it as a college student, matching the subtitles to the sounds. In Swedish, he could only converse on the darkest of subjects. Listen she said, everything ends, every single relationship you will ever have in your lifetime is going to end.... I'll die, you'll die, you'll get tired of each other. You don't always know how it's going to happen, but it is always going to happen. So stop trying to make everything permanent, it doesn't work. 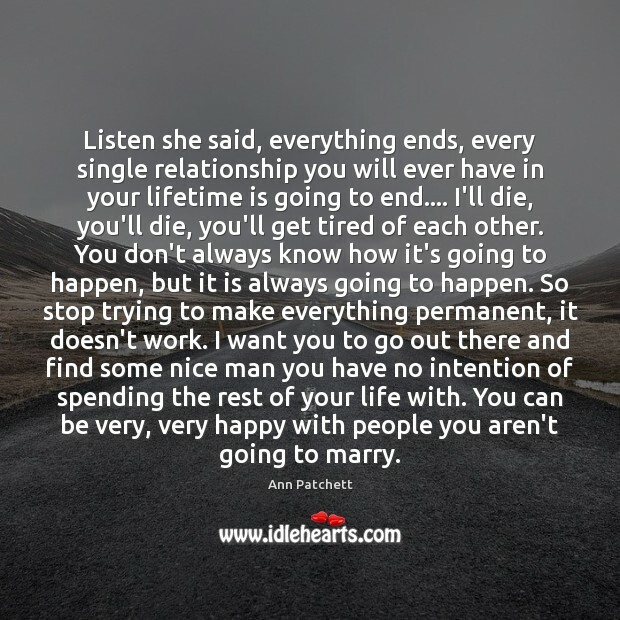 I want you to go out there and find some nice man you have no intention of spending the rest of your life with. You can be very, very happy with people you aren't going to marry. 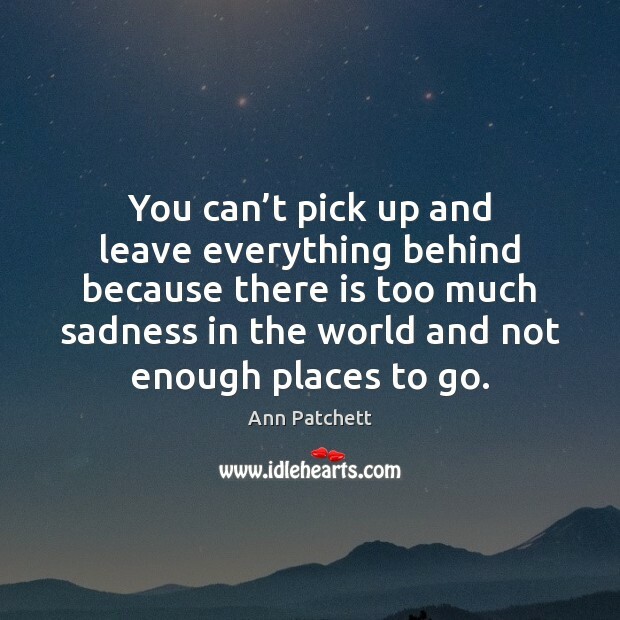 You can’t pick up and leave everything behind because there is too much sadness in the world and not enough places to go. 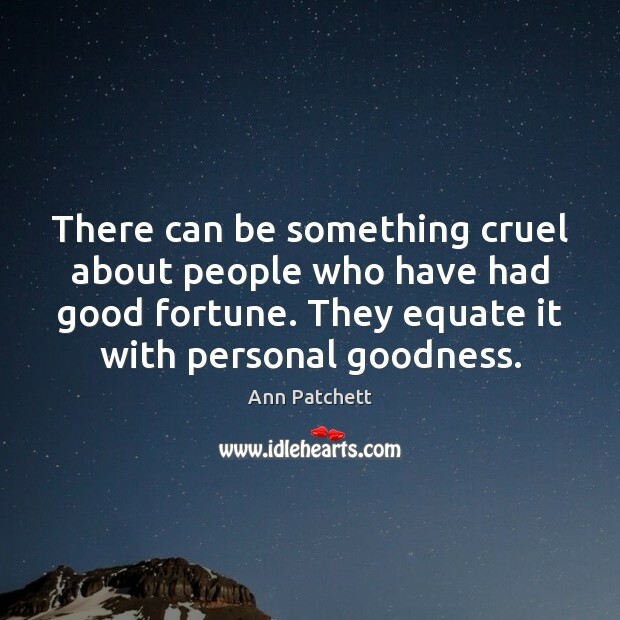 There can be something cruel about people who have had good fortune. They equate it with personal goodness. Art stands on the shoulders of craft, which means that to get to the art, you must master the craft. 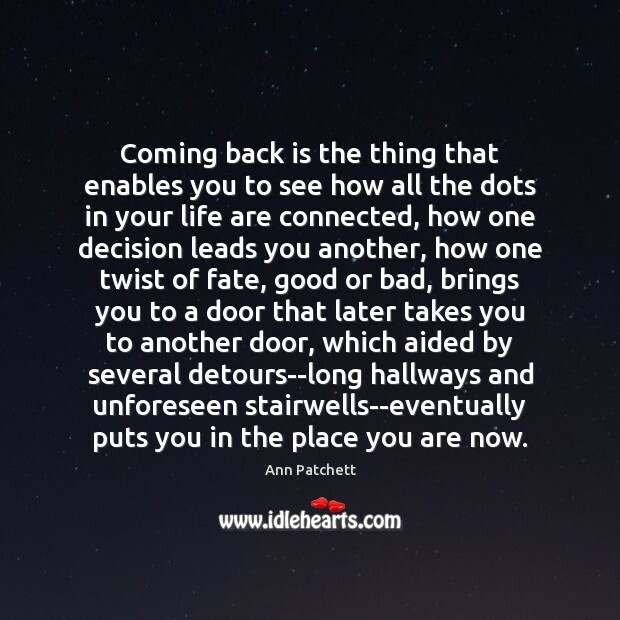 Coming back is the thing that enables you to see how all the dots in your life are connected, how one decision leads you another, how one twist of fate, good or bad, brings you to a door that later takes you to another door, which aided by several detours--long hallways and unforeseen stairwells--eventually puts you in the place you are now. 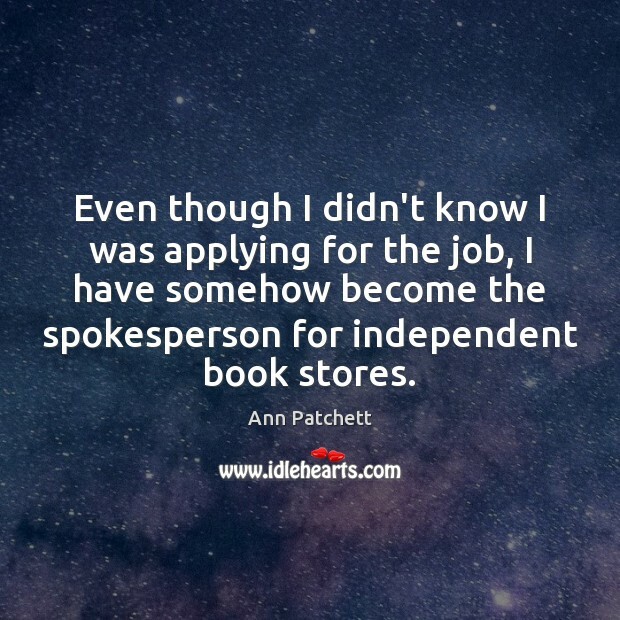 Even though I didn't know I was applying for the job, I have somehow become the spokesperson for independent book stores.